It's been over six years since Olympus released any new 4/3 DSLRs, the E-5 being pretty much the last of the breed. But everyone is now noticing that the latest lens catalog from four-thirds.org also states that production of 4/3 lenses has now officially stopped, as well. As I write this, subsidiaries like Olympus USA still list the 4/3 lenses as available (most with big 25% discounts at the moment) and B&H still lists them as current (typically Special Order, though). I expect this to start changing soon as supplies run out. 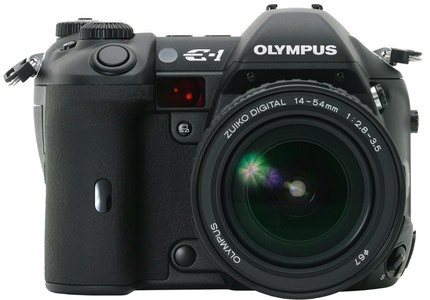 I wasn't very kind in 2003 when Olympus brought the 4/3 DSLR into being with the E-1. I wrote specifically that using a 4/3 sensor for a DSLR was like bringing a knife to a gun fight. Another quote from my comments in 2003: "Does Olympus really think that they can get a premium over the the Canon 10D, Nikon D100, and Fujifilm S2 Pro with fewer pixels and the requirement to buy new lenses?" More importantly, we already had a 11mp full frame Canon 1Ds and a 14mp Kodak Pro 14n DSLR back when that first 5mp 4/3 Olympus DSLR appeared, but the real issue was that sensors then didn't have very high QE (quantum efficiency), fill factor, or lack of read noise, so dynamic range wasn't close to what we expect from sensors today, and a smaller sensor suffered more from all those things plus the issues with the randomness of photons. Thus, smaller sensors were really challenged in low light situations. Heck, all sensors were challenged in low light situations back then, but smaller was a clear disadvantage. Unfortunately, we can't go back to 2003 and see reliable, repeatable, tested raw results that are directly comparable, but we can go back to 2007 when the similarly-priced 10mp Olympus E-3 and the 12mp Nikon D300 came out. So even four years after 4/3 appeared, the flagship 4/3 DSLR was still struggling against the flagship DX DSLR, with more than a stop difference pretty much across the board. Over the years, Olympus iterated a number of 4/3 DSLR models, but another problem kept cropping up, too (pardon the pun): both the 4/3 DSLR bodies were often close to APS/DX body sizes, as were the lenses. That opened up other complaints about 4/3 DSLRs: because they had smaller sensors, they had smaller mirrors, too, and the amount of light getting through to the viewfinder was often referred to by users as a bit of a tunnel vision compared to the big full frame DSLRs that were beginning to proliferate, particularly when Nikon made their FX move in 2007. So why would you want a camera as large as the larger-sensor DSLRs, with a dimmer viewfinder, and a sensor that would struggle earlier in low light? When Olympus went mirrorless with m4/3 in 2009, the 4/3 DSLR was clearly about to be tipped into the grave. Olympus paid clear attention to better sizing choices with m4/3, evoking the smaller Pen (half 35mm film frame) cameras, and within a couple of years getting down to compact camera size with the E-PM1 body. Therefore the current mirrorless m4/3 system now has a bit more differentiation from the modern DSLR than the 4/3 DSLR ever did, plus sensors have gotten so much better that m4/3 perform more decently in low light while the EVF makes up for the tunnel vision viewfinder. So we're now down to three DSLR systems with mirrors and prisms (Canon, Nikon, and Pentax) with a hybrid from Sony (fixed mirror SLT models). Of those, the Canon and Nikon systems have over 90% of the sales. The next DSLR vulnerability is how long the Sony SLTs are viable given their very low sales numbers.